“Scattered thunderstorms” was the forecast for today. We had shrugged and fully expected to see little if any rain as usual in Langtry, Texas. Landowner Jack Skiles visited our digs yesterday and asked, “Have you considered moving any of the heavy stuff [equipment] out of the canyon while the road is open, they say it might rain?” We nodded and went back to work busily trying to finish our excavations and get our final SfM photo documentation completed to make ready for the geoarchaeological sampling that was to happen today and tomorrow. Jack had just got the road serviceable again last week — it had been washed out last month after a 1.5″ rain — but sunny windy weather had dried it out quickly. “Scattered thunderstorms,” no problem. 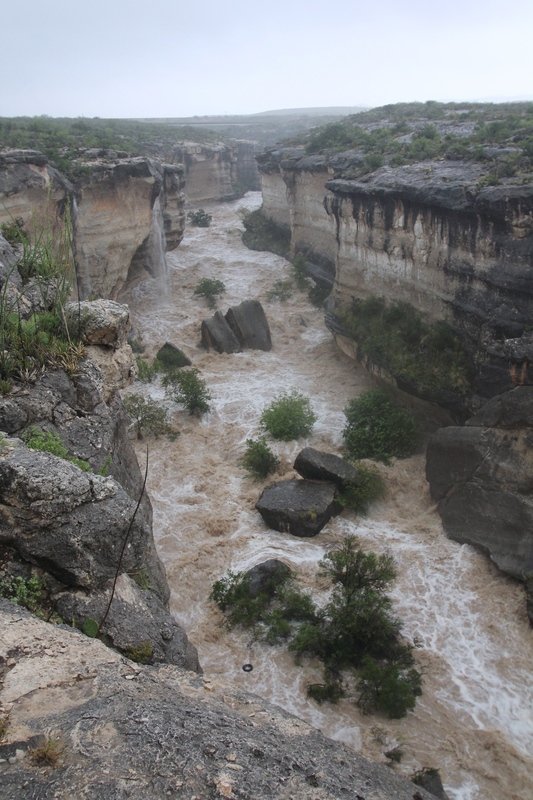 The rain began around 4 am at the Skiles’ house overlooking Eagle Nest Canyon, and in less than eight hours 11.6″ of rain fell. The Canyon ran deep as the following sequence of photographs attest. 9 am, view up Canyon toward Eagle Cave. 9am, Steve Black looks across to Kelley Cave and Skiles Shelter and ponders Plan B. 10am, view up Canyon, Eagle Cave on the left. 10am, Wilmuth and Jack Skiles with Eagle Cave in the background. 10 am, lower Canyon with Kelley Cave on the left. 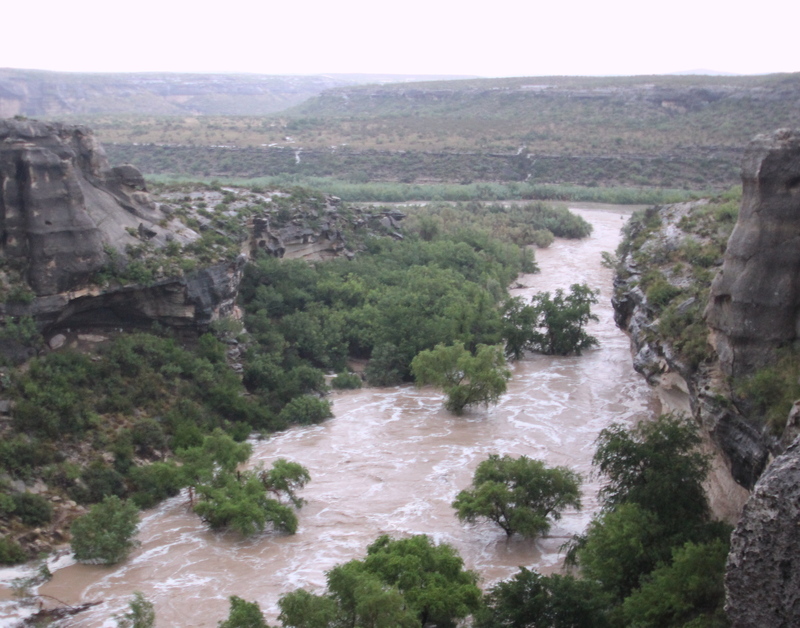 The Eagle Nest Canyon flow is so strong that it is pushing water up the Rio Grande (to the right in background). ENC Pour-Off 11:30 am. Around this time is when the flood peaked. 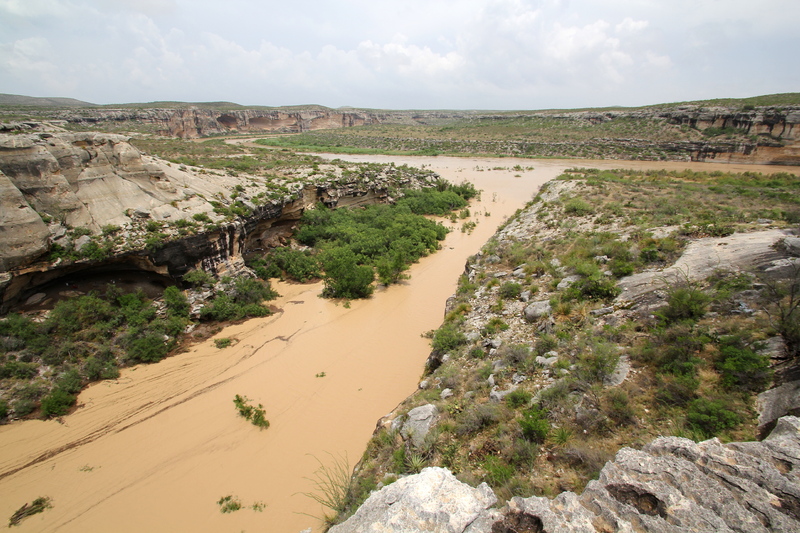 Eagle Nest Canyon Flooding in 2010 (left) versus 2014 (right). This flood was not the first massive flood event ASWT has experienced at Eagle Nest. 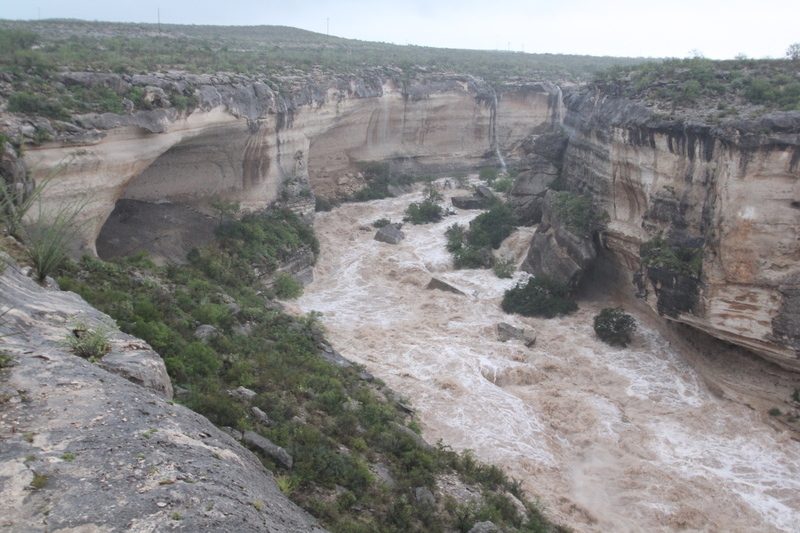 In 2010, after receiving 12″ of rain over a 4 day period, the canyon went on what we thought was a massive flood (photo on left). Little did we know that by 11:30 am the flow of water over the pour-off into Eagle Nest Canyon would dwarf anything we had ever seen. 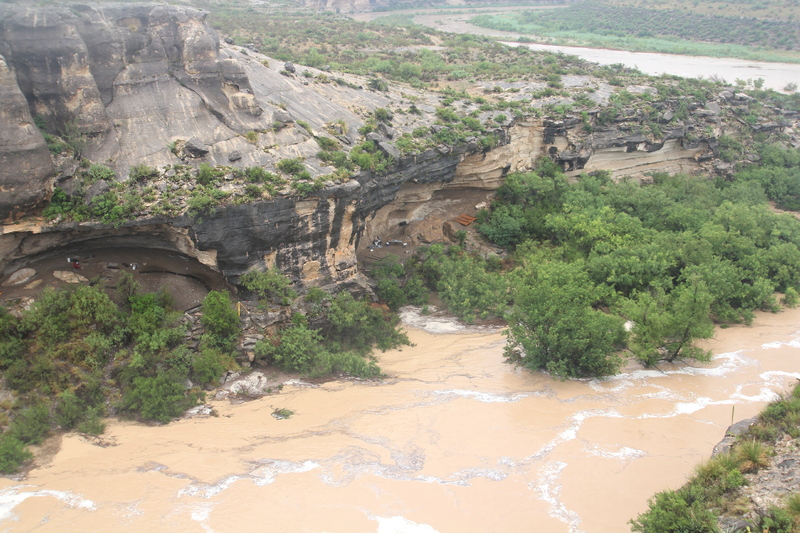 Noon, Kelley Cave and Skiles Shelter with the Rio Grande in the background. Noon, view down Canyon, Eagle Cave on right with waterfalls. Noon, view upstream from above Eagle Cave. By 12:30 the flooding had started to subside. The water level did not get up into the shelter, but the lower couple dozen feet of our trail was washed away down to bedrock. 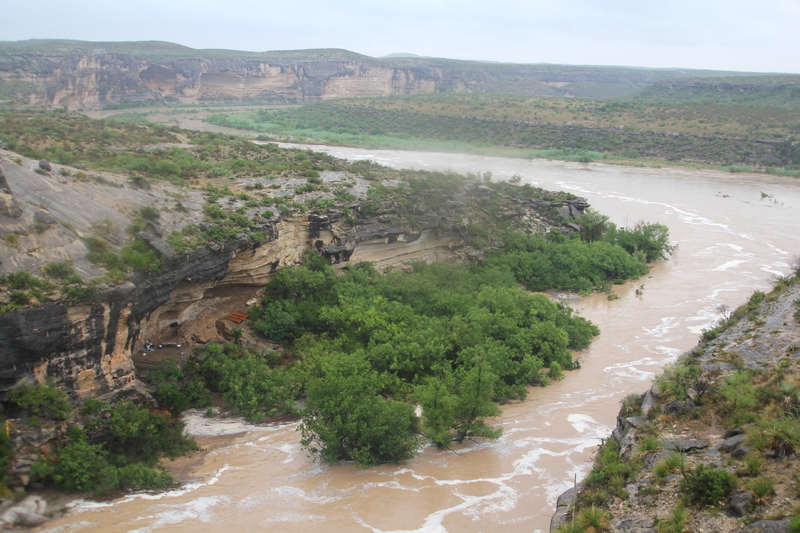 12:15 pm, mouth of the Canyon, Skiles Shelter on the left. 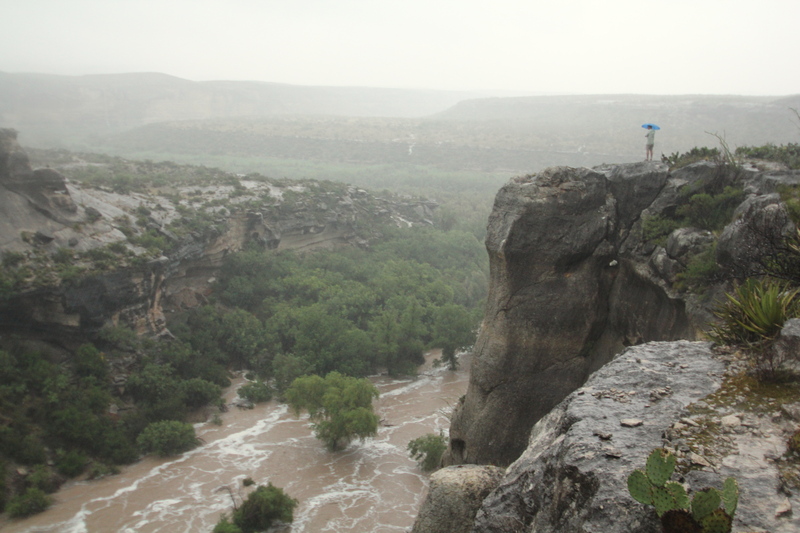 12:30 pm, Kelley Cave and Skiles Shelter with the Rio Grande in the background. 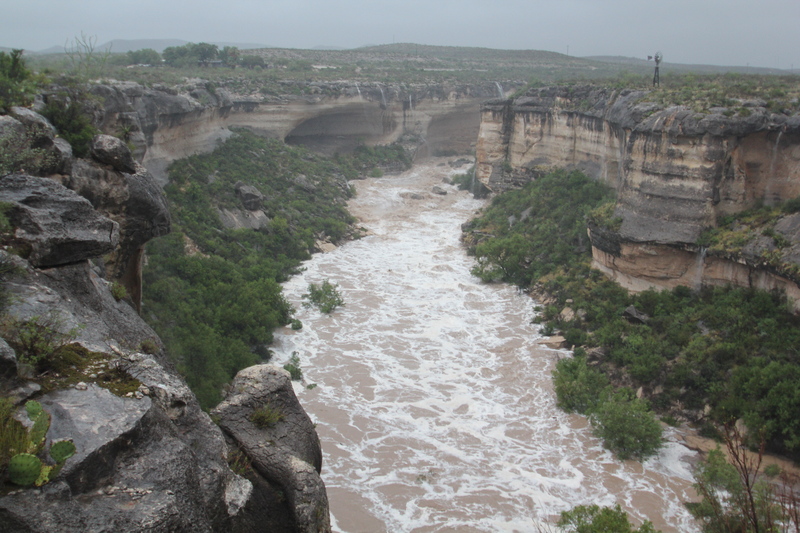 2:30 pm, view of the mouth of the Canyon. 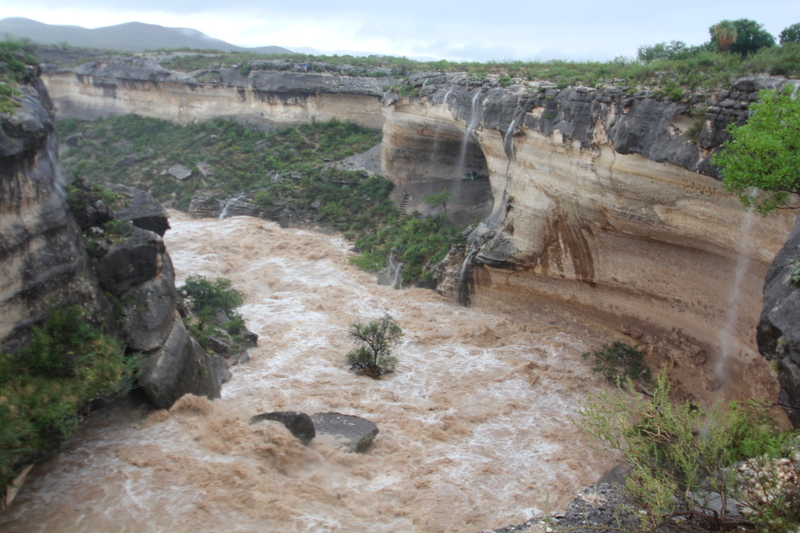 The flow is now starting to flow back into the Canyon from the Rio Grande. 6 pm, mouth of the Canyon. The water is slack and backed up from the Rio Grande. 6 pm, view upstream to Eagle Cave. 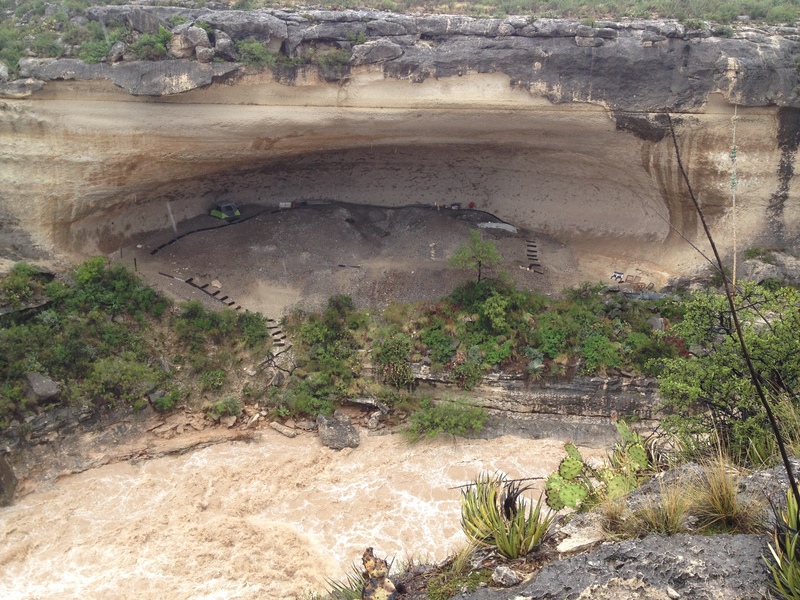 Tomorrow we will venture into Eagle Cave using the upper “Goat Trail” and continue working with Charles Frederick and Ken Lawrence while they do geoarchaeological sampling of the deposits in Eagle. This flood event has reminded us of the power of water in the desert, and how all of the sites within Eagle Nest have been (and are being) impacted by flooding. Incredible! The photos are great, but of course not the same as being there. Any videos with sound? All I can say is WOW! And Murphy was right. Charles Frederick and I took most of the as-it-was-happening shots during brief periods between heavy downpours and didn’t think to try to take video. We should have at least tried to record sound — deafening roar and shattering splatter. Murphy was right. I took one short video near noon from above eagle cave but the sound does not come anywhere close to doing it justice. Thanks for sharing the photos. 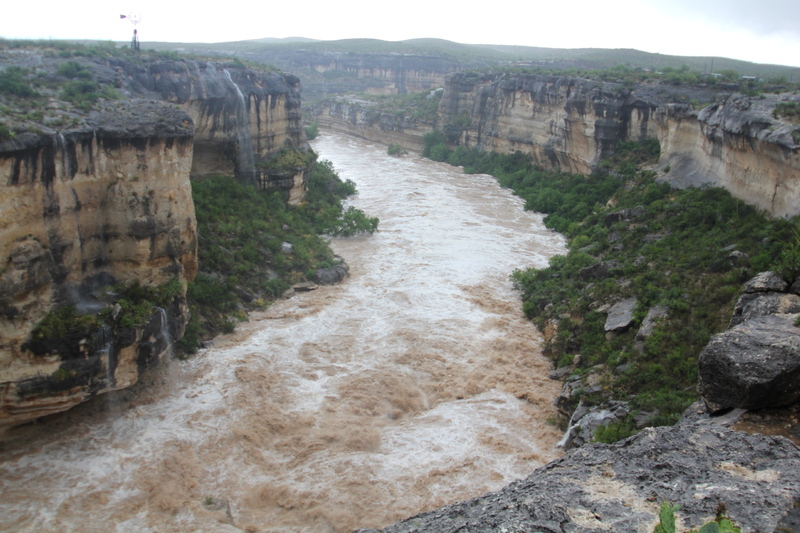 Hope you’ll be able to get all your equipment out of the canyon after all this rain. Great for the countryside, not so great for your project plans. Amazing photos! Be careful on the goat trail. It’s going to be slippery! Be safe. These photos are remarkable. The comparison to 2010 was most interesting to me. Is it likely that there were ever events that brought water inside of the rock shelter and would that cause any trouble for you out there? 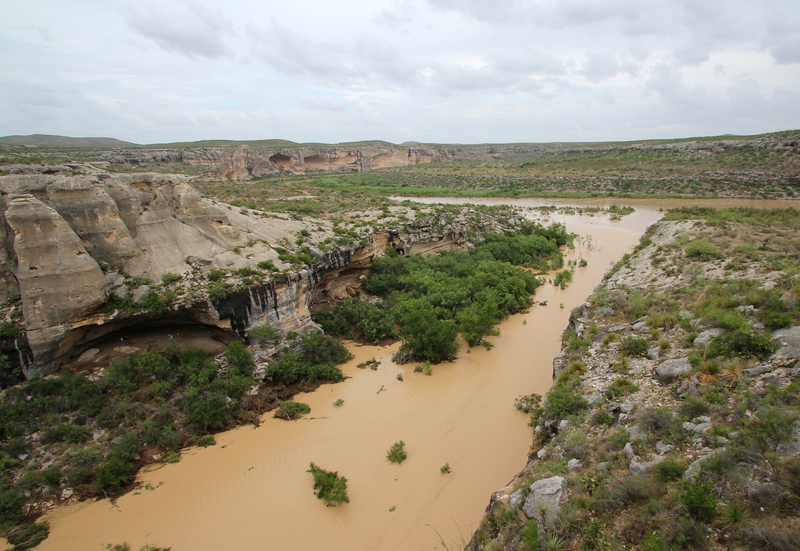 Hi Marcus, we have found evidence of flood events in the shelters closer to the Rio Grande, but so far not in any sites further away from the river. If a flood did get high enough it could scour out a shelter and remove deposits (we think this may be the case in Skiles Shelter, but that will have to wait for a future post), and we will need to keep this in mind as we continue excavations! Fantastic post. I was at the white shaman in July 2010 for that event. I would loved to have seen this one. Thanks for sharing your thoughts and the photos. My family has deep roots in Langtry and I have shared this link with many of them. I know they wish they could have been there to witness this awesome natural event. Your photos helped bring us back to Langtry. Keep your eyes out for artifacts on the canyon floor. Amazing pictures, that you don’t ever see in Wisconsin! Thank you for sharing such amazing photos!!! Thanks for sharing the amazing photos!! Keep up the good work out there! Incredible water and photos! We enjoyed our stay at Shumla some years ago, thanks to Donna & Tom Mueller. Now we are always interested in the treasures in this area of Texas. Wow, thanks for making pics available. Viewing these ought to be mandatory for anyone camping in the Southwest! Thank you for sharing from the owners on the Ingram Ranch, 8 mile North of Langtry or about 22 river miles from the High Bridge. And the ancient ones picked a good place after all. Amazing photos thank you for sharing. Oh my gosh! Those photos are amazing! Nature never ceases to amaze. Be careful out there. I am assuming Plan B was, “Rain Day”! How about Horse Trail? Cute, real cute, Dana! As a matter of fact, we had to put finishing Horse Trail on next year’s list. google the ”Sanderson flood of 1965” when it gets bad, its real bad! AWESOME Photos!!! I pass there all the time I live in “Sanderson”. All I can say is WOW!!! This reminds me of a story I heard from an old friend mine who was returning to UT in Austin from Marfa back in the 1930’s. 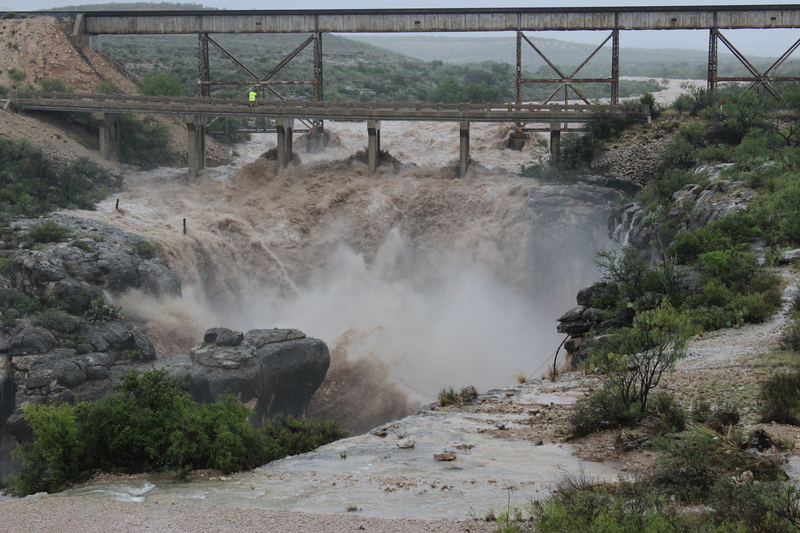 There was a big flood that washed away the bridge at Highway 90, there at the current Pecos River bridge. It took him 3 days to get back to Austin. Fantastic pics. 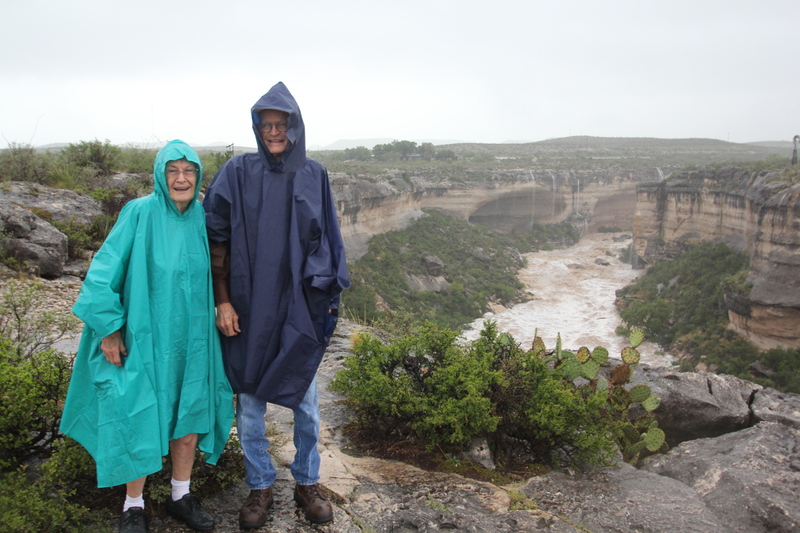 We were on Lake Amistad a few days after this. 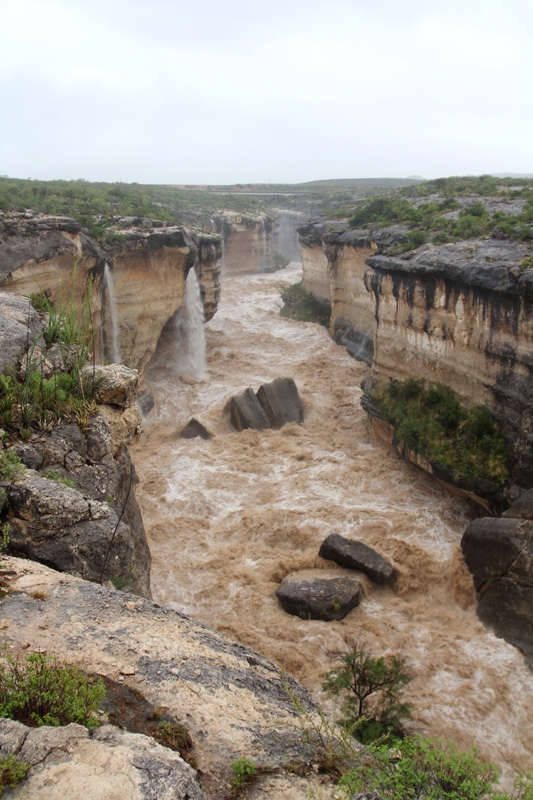 This flood added 5 vertical feet to a 65,000 surface acre lake! Desert floods are quick, powerful and dangerous for the ill-prepared. 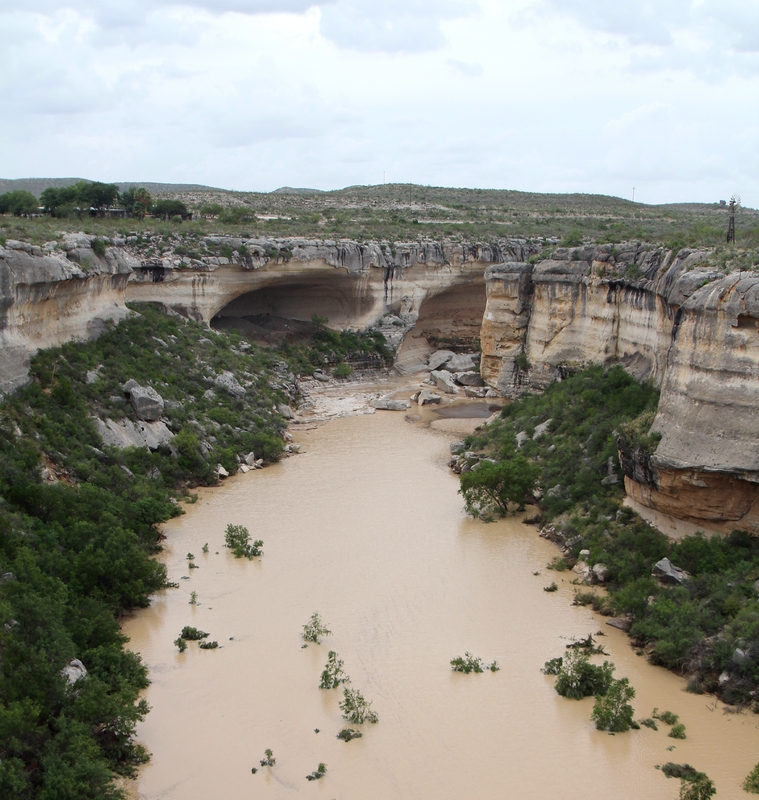 Beware the Rio Grande!